When I was in Israel for a year on a Fulbright conducting research I interviewed Israelis, Palestinians, and Israeli Arabs. I asked them to talk about their ideas with respect to peace. The Israelis invoked the language of security, the Israeli Arabs spoke of fairness, and the Palestinians of historical justice. Clearly, these groups live in incommensurate realities. For the Israelis 1948 was a glorious War of Independence; for the Palestinians it was the Nakba or disaster. Zionism to an Israeli is a moral imperative to reconstitute and protect the Jewish people based on the human right to self-determination; for the Palestinians it stands for colonialism and occupation. 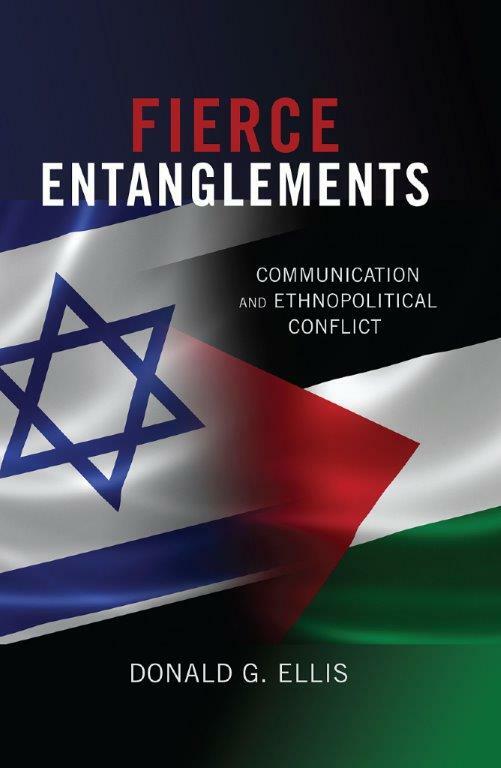 In a newly published book, Fierce Entanglements: Communication and Ethnopolitical Conflict (Peter Lang, 2015) I take up the issue of intractable ethnopolitical conflicts and argue that micro-communication approaches to relationship change are equally if not more important than macro political solutions to the conflict. The goal of conflict resolution is to moderate and bridge these incommensurate realities. Political solutions by leaders and elites, necessary as they are, do not directly redress subjugation, inequality, and oppression. Decisions that emerge from political leaders and elites become directives that are “sold” to the masses. Issues and solutions do not emerge naturally from the conflicting parties and the more resolutions reflect political accommodations and elite interests the more remote they are from the population. In the case of the Israel-Palestine conflict an Israeli Jew striving for deeper understanding of the displacement of Palestinians in 1948, or a Palestinian coming to understand the historical discrimination against the Jews and the Holocaust are equally as important as treaties and agreements, and crucial to the transformation of consciousness that closes up gaps between political cultures. Israelis and Palestinians have extremely little contact. Even though there are occasional joint activities and peace promoting processes it remains the case that the average Israeli and Palestinian have never had a “normal” interaction with the “other.” They are locked in a difficult ethnopolitical conflict laced with strong emotions. But ultimately, the two sides must talk to one another. The public as well as many academics are cynical about the effects of these dialogue activities but such opinions are misguided. Critical dialogue is a primary conflict resolution tool, and research clearly shows that communication processes such as engaging with the other side, critical self-reflection, appreciating differences, and alliance building are associated with successful bridging discourse. Bridging discourse begins with groups separated by considerable dispositional, cultural, and political differences and seeks a way to communicate so as to represent the compatibilities or potentialities of the discourse on the other side. One avoids the tendency, as much as possible, to stay within the confines of your own discursive world. Mandela bridged the language of struggle with the language of nation building among white South Africans, and consequently neutralized the discourse of violence amongst his associates along with diminishing the power of apartheid on the other side. An Arafat or Netanyahu have failed to connect at the macro level the communicative virtues of successful bridging discourse. But what are these virtues? Ethnopolitically divided groups can be directed toward two types of communication, namely, dialogue and deliberation both of which have preferred patterns and conditions of interaction. And both of which are associated with improving the probability of desired results which include identity widening, empathy, listening sensitivities, alliance building, and the rationalization of the relationship. Dialogue is not the spiritual experience it is sometimes portrayed as; it is not an unapproachable ideal cast in the abstract language of mutuality. And it is not only about human relations. Rather, dialogue is designed to create new meanings and make change possible. Since all conversation has the potential to create new meaning, dialogue is an enhanced version that maximizes the chances of altering meaning in a desired manner. Dialogue is more serious than routine every day conversation and it is not based on pre-rehearsed positions. Getting the parties to a conflict to engage in the quality of contact that achieves dialogue is not easy, but it is possible. Deliberative democracy and deliberative communication are another pattern of communication most central to the resolution of differences between deeply divided groups. The gritty communicative work of grappling with differences between groups is significantly tamed by the principles of deliberative democracy. Structuring contact between conflicting groups in accordance with principles of deliberative democracy is the best way to manage the plurality and differences that are the result of ethnopolitical tensions. Deliberation is rooted in democratic principles that privilege inclusive means and values as well as argument, as the German sociologist Jurgen Habermas showed. Deliberation, as Dryzek explains, is the kind of communication that induces reflection upon preferences in a democratic and non-coercive manner. Ethnopolitically divided groups have much more to do than simply agree upon a division of resources. Their conflicts are identity-based where issues such as religion and group descent are highly implicated. If both conflicting parties have group rights then structuring their resolution efforts on the basis of democratic principles is most conducive to realizing those rights. As of now Israelis and Palestinians are at theoretical loggerheads in that the two groups have democratic rights but these rights are inconsistent, contradictory, or incompatible. Hence, we get the incommensurability referred to above. Dialogue and deliberation, which are subject to procedural requirements, set into motion the norms of communication necessary for solving problems. This is the only way to peacefully and authentically close up the political and cultural gaps that separate groups and improve the lived experience of both the other and the self. Communicative processes designed to solve con flicts are messy and challenging. But given the potential for violence and destruction in the Israel-Palestinian conflict, it is a challenge we cannot afford to ignore.